The contact details of the Rector can be found below. The Webmaster can be contacted using the contact form at the bottom of this page. St Bride’s Episcopal Church is a charity registered in Scotland, No. SC012625. Car parking on Hyndland Road is often difficult, but slightly easier on Sundays. Nearby side streets offer more parking options. First Bus 4 and 4A stop on Hyndland Rd a 5-minute walk from St Bride’s. Numerous buses pass along Great Western Rd, which is a 5-minute walk from St Bride’s. By train St Bride’s is most easily accessed from Hyndland station. 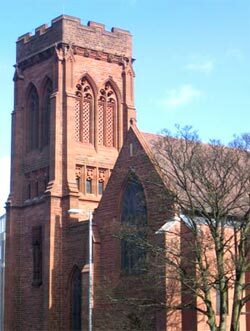 From the station take a 5-10 minute walk up to the top of Novar Drive, which meets Hyndland Rd, turn left and St Bride’s is in front of you, across the road. There is a very responsive pedestrian crossing for you to use. From the street there is a step up to the left side (north) porch door, with a portable ramp if required, and inside the porch there is a stair lift for disabled access to the main church. Ask a sidesperson (steward) if you require any assistance, and they will be happy to help you. From the nave there is a step up to the Lady Chapel, which is open to the nave, and a step up to the level from which the toilet is reached. The Crypt is fully wheelchair accessible from the street, via the left side rear door, and there are new toilets immediately inside this door, including a disabled toilet and baby-changing facilities. If you cannot manage steps in the church, communion will be brought to you. This is standard practice, so please ask a sidesperson.